This Ways to Wear series has definitely become my favorite. I've been posting outfits for a little over a year now, and it really is fun to look back and see the ways I have worn different things. And really, that's the whole point of posting outfits in the first place: to come up with ways to wear things I already have. 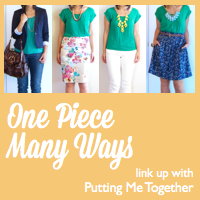 So without further ado... 4 ways to wear it! (to be read in that announcer voice I am always talking about). First, the pants. They are from target and they are really great. They are a great length, a great fit and relatively thick. They feel much more expensive than they are. They are really similar to these from Target. I have also included a few pairs below if anyone is interested (all of the ones below come in blue). I love that the blazer makes the bright colors work for the office (at least for my office). Also, I love green and blue together, so win-win. This is what I wore for my first day of teaching last year. The silky blouse is professional, but the two blue colors add a little spark (or so I convinced myself when I got ready that day). This is one of my favorite outfits to date. The colors are similar to the first outfit, but it's a bit more flowy, which I love. Ah, this outfit. It was taken way before I knew that was best to take photos outside during the day, but hey my hair was cute? So, what about you? Do you have any blue dress pants? Which outfit is your favorite? You're inspiring my cobalt pants situation. That sounded a little weirder than I intended. Moving on. If I had to pick a favorite I would choose the one with the blazer because I just love blazers. The simple white top with the lighter blue flat is a close second though. So cute! I love blue and green too, especially the shades you wore. These are all adorable! Ash, your hair was cute indeed! :) all the outfits look great but I especially like #1. 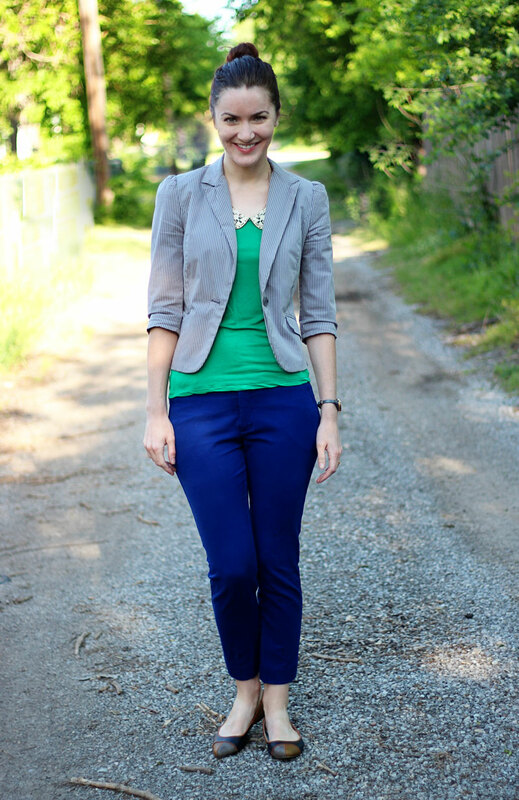 Green tee, blazer and blue pants with that top-knot make for a perfect outfit. Great post! I love the one with the blazer! I could see myself wearing the fourth option a lot! 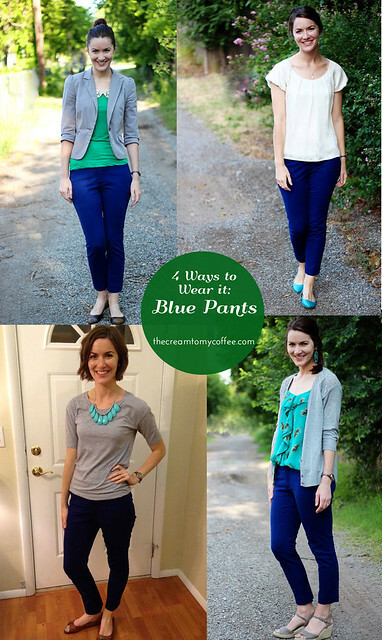 Blue pants are so versatile! 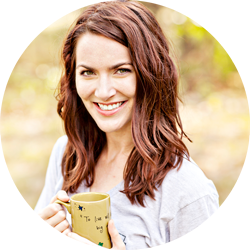 I have blue pants (ankle and a pair of cobalt jeans) and I really love them, they are super versatile. I also have a black pair of the same Target pair, I'm wearing them today actually, and you are right, they are thick and a good quality. I love the pants with the white top, but I also like it with the grey top, too. I was hoping to find a pair of blue pants this weekend, but no luck. Maybe one of the links you provided will work out for me! Love all the different looks ! Oh gosh, I love these! 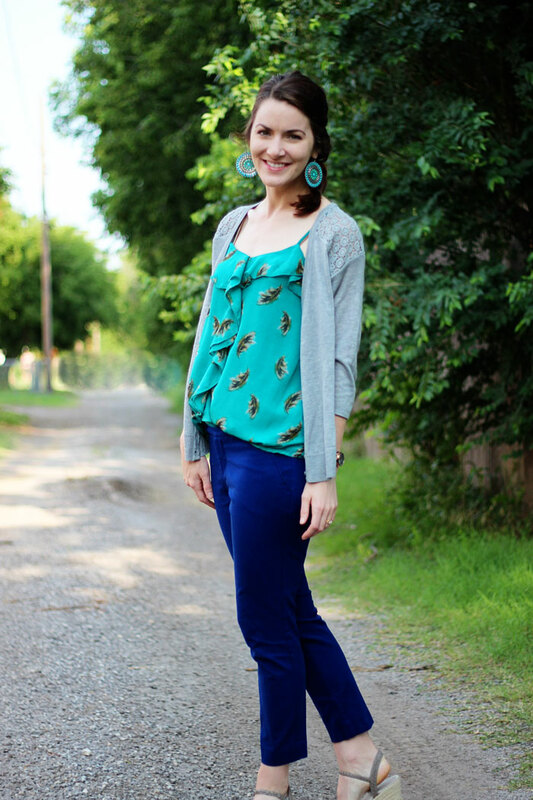 I LOVE how you paired it with colors that are close to cobalt, like the green top, teal shoes, teal tank, and teal necklace. ADORABLE. I absolutely L-O-V-E blue pants!! Thanks for the cool styling tips!